Brown bread is a staple in our house, every morning it plays a major role in our breakfast menu. Toasted brown bread with boiled eggs, sunny side up eggs, cloudy eggs – turned eggs, scrambled eggs, omelettes. Rashers, sausages – anyone that knows me and my family know that breakfast is a big deal in our house! We also eat a lot of eggs! I always buy free range eggs and, I love duck eggs; they are my weekend treat. We never eat cereal – we are probably very old fashioned but it just never happened, I personally do not enjoy eating cereal and it goes with my mantra – you only get 3 meals a day so each one should be very tasty. 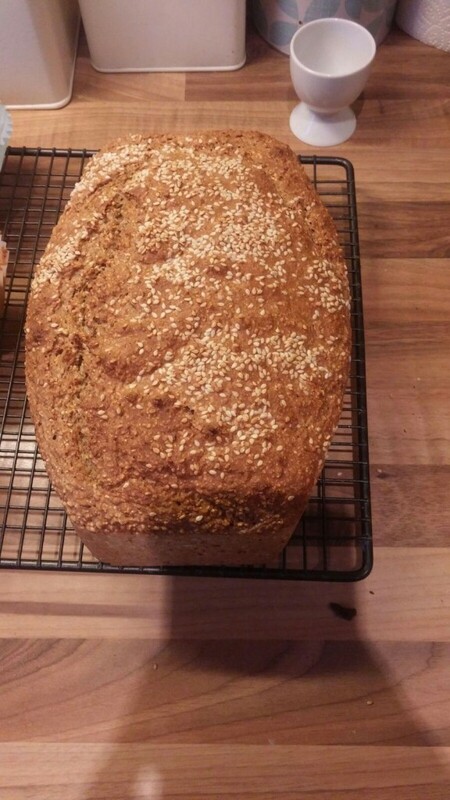 I use a silicone loaf mould as it makes the brown bread process much easier. 1. Weigh out the white and brown flour, and put into a wide mixing bowl, measure out the bread soda, I have measuring spoons and I would recommend using them to correctly measure the bread soda, salt and sugar. For the bread soda weigh out and pour into the palm of your hand, using the back of your spoon run over the bread soda to remove any lumps and then sieve it into your flour. 2. Mix all the dry ingredients, make a well in the centre and pour 3/4 of the buttermilk into the well, using your left hand to hold the bowl, use your right hand to mix the dough, starting from the inside and imagining that your right hand is a mixer starting in the centre and moving in circles in the one direction, turn on the mixing and keep mixing until it all comes together , if the mixture needs more liquid use the remaining buttermilk. 3. When the mixture is all mixed pour into your greased bread tin or silicone loaf mould. 4. It will be quite wet and should very easily pour into your mould, if you wish at this stage to put some sesame seeds on the top or oat flakes that’s optional but I nearly always do,they look great and are packed with goodness, place into the oven for approximately 45 minutes, test after 40 by placing a knife through the centre , if the knife comes out clean it is done. If not put it back in for 5 minutes and again check. 5. When the bread is done take it out of its mould/tin and let it cool on a wire tray if you have one , or take a shelf out of the oven – you want to allow the bread to aerate while cooling.